On the Deschutes River, the Colorado Avenue Dam creates an impoundment that was once used to support lumber mill operations. The dam currently maintains water surface elevations upstream in the Mill District area, and is located in an area of the river that is heavily used during the summer months by people on inner-tubes and other inflatable craft that requires little skill to operate. The current dam and footbridge configuration blocks downstream passage and requires all river users to exit the river and portage around the impediment. This requirement to portage around the dam exposes a high number of low-skilled users to the potential of being swept into the dam which creates a sieve-like, pinning hazard. Teamed with OTAK, Pacific Habitat Resources, and RiverRestoration.org, GreenWorks provided a safe passage over the existing Colorado Dam for many types of river users including inflatable craft, and whitewater play features for hard shell boats including kayaks and canoes. 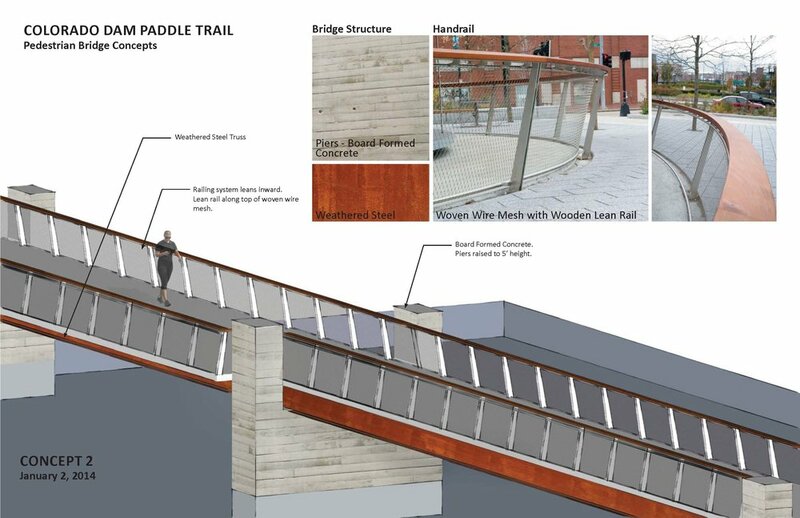 In addition to the in-water recreational components, the design proposes increased habitat diversity along the reach by incorporating fish passage and on-bank habitat restoration, design improvements to McKay Park, and removal of the existing pedestrian bridge and replacement with a new, higher, pedestrian bridge. TriMet’s MAX Light Rail system connects Portland, Gresham, Beaverton, Hillsboro and the Portland Airport. As a part of TriMet’s commitment to build and maintain a safe transit system, GreenWorks is assisting the agency in reviewing its existing lighting and access control design standards for the MAX stations. The overall goal is to create a safe and secure system of transportation for its patrons. Initially, this process will review, analyze, design, and implement prototype improvements to the existing lighting systems and access control at two eastside LRT platforms, both located on the TriMet Blue Line the stations of 82nd Avenue and Gresham Central. Design illumination and access control improvements will complement the existing architectural character of these two platforms. The improvements will be completed in coordination with internal and external stakeholders, and TriMet’s leadership review board. GreenWorks provided documentation of the site review of the two stations and a report including mapping of existing site conditions, an inventory of site elements, mapping of site opportunities and site constraints, an illumination assessment and light readings from the two stations. Building on this field research, our work included schematic design and construction documents. After implementation, our services will include a post occupancy analysis to inform the design analysis and may contribute to the modification of the TriMet Design Criteria. GreenWorks provided conceptual planning and design for the redevelopment of TriMet’s Light Rail station at East 188th Street in the Rockwood neighborhood of Gresham, Oregon. A neighborhood in transition, Rockwood is part of Gresham’s first Urban Renewal Area. The 188th station in particular has the highest number of riders in the city. Station redesign focused on attracting redevelopment in the area through improvements to the 188th and East Burnside intersection, expanded access and capacity of the stations, pedestrian-oriented facilities, user safety, visibility and CPTED (Crime Prevention through Environmental Design) design. The station design exceeded the local stormwater requirements and incorporated infiltration planters adjacent to the platforms as a terminus for the platforms. The approved design incorporated significant redevelopment of the transit platforms, shelters, trackways, signage, landscape plantings and other features. Final presentation drawings and perspective sketches were prepared and presented to the Urban Renewal Commission. 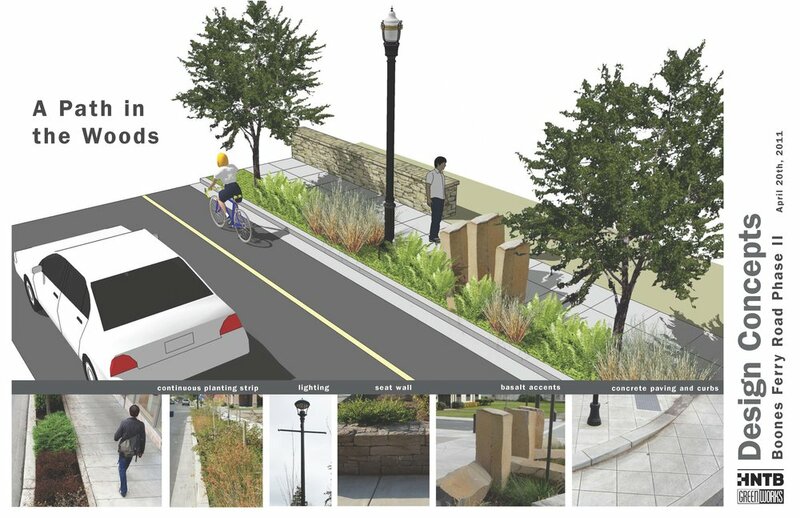 GreenWorks developed concept plans and working drawings for pedestrian improvements related to a street renovation project in downtown Gresham. The project required citizen involvement meetings and coordination with utility companies and state officials. Pedestrian improvements were applied to five “core” downtown blocks including; bomanite crosswalks, new sidewalks of patterned concrete, street trees, benches, litter receptacles, and ornamental street lights. Considerable design time was spent evaluating various alternatives for streetscape layout. Reference: City of Gresham.